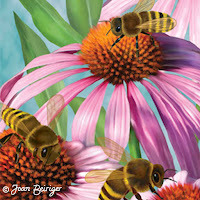 Joan Beiriger's Blog: Art Licensing: Mary Engelbreit's Amazing and Continued Licensing Success! Art Licensing: Mary Engelbreit's Amazing and Continued Licensing Success! With over 40 years of licensing her art, artist Mary Engelbreit® is still going strong, continuing to draw and license her art. As she states in her biography "I plan to drop dead at my art table. I can't explain to you the pleasure and true happiness I get from drawing! I'm just so glad other people like it, too!" That statement expresses what other artists feel when they are passionate about creating art, and that is a major attribute needed to be successful. Mary Engelbreit is successful, VERY successful! Mary Engelbreit Studios now has contracts with dozens of manufacturers who have produced more than 6,500 products, with more than USD 1 billion in lifetime retail sales. Mary and her staff continue to license her art so that the growth is not so fast that it floods the market and damages the Mary Engelbreit brand. They also protect the brand by making sure that they choose manufacturers that reproduce Mary's artwork as faithful to her original art as possible. Recently Mary Engelbreit partnered with studio•m by magnet works to produce her own unique version of a miniature fairy garden. 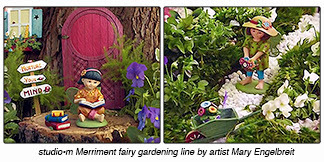 Merriment is an adorably different kind of fairy gardening line that is full of character and personality. The line was introduced by studio•m at the 2016 Atlanta Gift show. View the video "Introducing Merriment by Mary Engelbreit" that shows how the line was developed. Why is the Mary Engelbreit Brand Successful? For most artists, overnight success is a myth, but not for Mary Engelbreit once she started selling her greeting cards in 1983 at the New York National Stationery Show. Her initial offering of 12 cards at that show quickly grew to almost a hundred cards by 1986 and had blossomed into a million-dollar-a-year business. I have stated in other articles that "Art brands tend to sell more products than non-brands because the customer base grows as the brand becomes more popular. To become a brand that is recognized by consumers the art must be unique and different from other art. And, to become successful and stay successful the brand must resonate some emotional response with the consumer, appeal to a wide spectrum of consumers, grow slowly, and stay true to the look of the brand but continue to be refreshed." That is exactly what Mary Engelbreit has done with her brand and why it is so successful. Her brand has a huge fan base because Mary's art is cute, unique, and resonates with the consumer. Her art style is widely recognized and sought after by consumers, and has appeared on a wide range of products including greeting cards, calendars, T-shirts, mugs, children and gift books, rubber stamps, ceramic figurines, jewelry, fabric, kitchen accessories, home décor toys, baby clothing, apparel, bags, medical scrubs, and anything else you can imagine. Thus, there have been and continue to be lots of products that consumers can purchase as gifts or for themselves. Below is a list of some highlights of Mary's career that I gleaned by reading articles, reading the book "Mary Engelbreit - The Art and the Aritst", and watching videos. See the below reference section for links to articles and videos. • 1977 - Mary went to New York to sell her illustrations for children's books to publishers but was unsuccessful. One art director recommended that she instead create greeting cards. • 1983 - Mary exhibited at National Stationery Show with her small 12 card line. She also hired an agent and started licensing her art for other products. • 1986 - Mary's greeting card business had grown into a million-dollar-a-year business. She decided to license her card images to Sunrise Publications so that she would have more time to create art. • Early 1980s to mid-1990s -Twelve Mary Englebreit stores were opened in malls across the United States. But they were closed by the mid-'90s because it took too much work and time that infringed on Mary creating art. • 1996 to 2009 - Mary was editor-in-chief of the award-winning creative lifestyle magazine “Mary Engelbreit’s Home Companion” covering topics such as family life, food, decorating, craft projects, flea markets and collectibles. Even though it had a large following, the lose of advertising revenue during the recession caused Mary to stop publishing the magazine in 2009. • 2001 - Mary saw her original dream come true when she signed a contract to illustrate children's books for HarperCollins. Her debut book, "The Night Before Christmas," has appeared almost every year during the holidays for 13 years on the New York Times best-seller list. 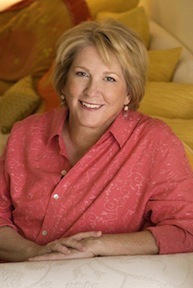 Note: Mary Engelbreit is one of a select few artists with three New York Times children books best sellers. • 2014 - animated video released of Mary Engelbreit's children's book "The Night Before Christmas". See the reference section for the link to the video that shows how the animation was made. Mary Engelbeit has received numerous awards and honors for her art during her licensing career. Listed below are a few of them. • 1998 - Wall Street Journal described Mary Engelbreit as "building a vast empire of cuteness". • 2000 - Mary was listed as the second best-selling licensed property Annual LIMA Gala & Awards Ceremony for the International Licensing Industry Merchandisers' Association (LIMA)– second only to Winnie the Pooh. • 2000 and 2002 - Mary Engelbreit was honored with the “Best Art License of the Year” awards at the Annual LIMA Gala & Awards Ceremony for the International Licensing Industry Merchandisers' Association (LIMA). • 2001 - Indoctrinated into the St. Louis Walk of Fame for her art and the national impact on St. Louis cultural heritage. • 2013 - Mary Engelbreit was honored with the Louie Award for Lifetime Achievement by the Greeting Card Association. • Article - "Mary Engelbreit: Artist and Entrepreneur" Note: You may not be able to see the text until you answer the one question in the dialog box below the title. • Book - "Mary Engelbreit: The Art And The Artist" published by Andrews and McMeel in 1996 and sold on amazon.com. • Video - "Mary Engelbreit Lifetime Achievement Award Video" This video was shown at the “Best Art License of the Year” awards at the Annual LIMA Gala & Awards Ceremony for the International Licensing Industry Merchandisers' Association (LIMA). In it Mary discusses her art and inspiration. • Video - "KETC | Living St. Louis | Mary Engelbreit" This video shows how an animation of Mary Engelbreit's children's book "The Night Before Christmas" was made into an animation video. This article was update 7/17/18. The first time I looked at the back of a Mary Engelbreit greeting card and read that she thanks me from the bottom of her heart for buying the card, I laughed and connected with her warmth, wit and honesty. So glad she continues to create and spread joy. Mary Engelbreit's art makes everyone happy. What a great foundation to build a brand on. Thank you for the years of smiles! Thank you Joan for all the work that you put into this article! Quite an inspiration! I miss the "Home Companion" too. I remember falling in love with Mary Englebreit's artwork in the 80's - while I was working as a designer, at Hallmark Cards in Kansas City, MO. Licensing was just beginning & it appears that Mary was one of the pioneers , amongst just a handful of others. Thanks for posting this research, Joan. Throughout the years, I've lost touch with Ms Englebreit. It's good to know that she is still going strong. I will have to check out some of your extensive work on this subject - get back in touch. You're so good at coming up with interesting subjects. Bravo to you! Thanks, Joan. It'll be interesting to see how this particular trend emerges.